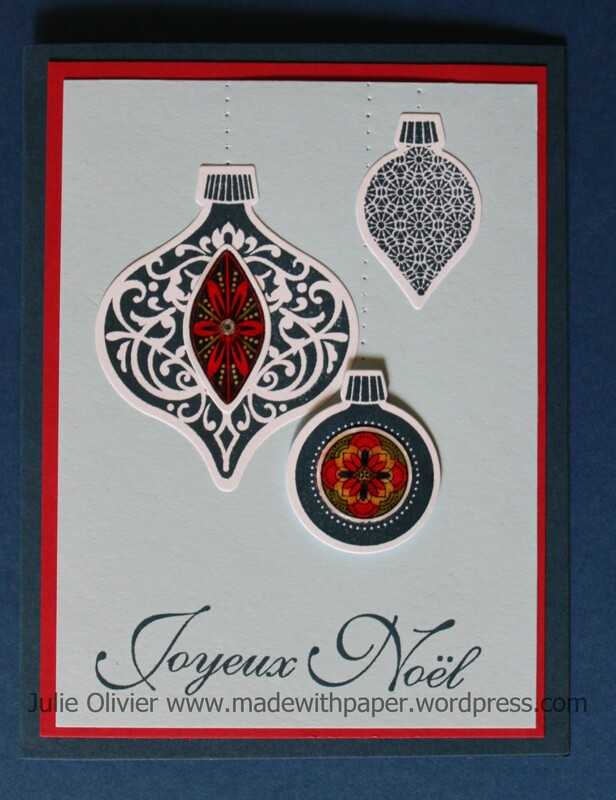 The new Ornament Keepsakes stamp set is one of my favorite in the Holiday mini-catalogue! I used that set as well as the matching Framelits dies to make this card. 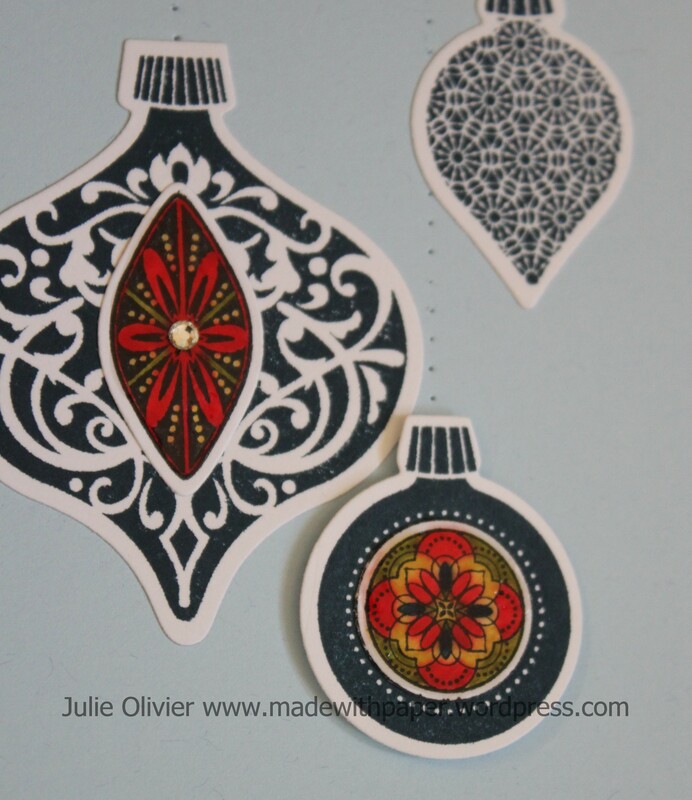 For the “center part” of the ornament, I stamped it with Midnight Muse ink and colored it with Markers. I used Crystal Effect on the center to make it “glossy”. I wanted to make it look like a stained glass ornament. I think the effect is nicer in real life than on the picture… I used the Paper-Piercing tool and the Paper-Piercing pack to make the “hanging” string. It’s so easy when you follow the template: perfectly lined up and spaced! 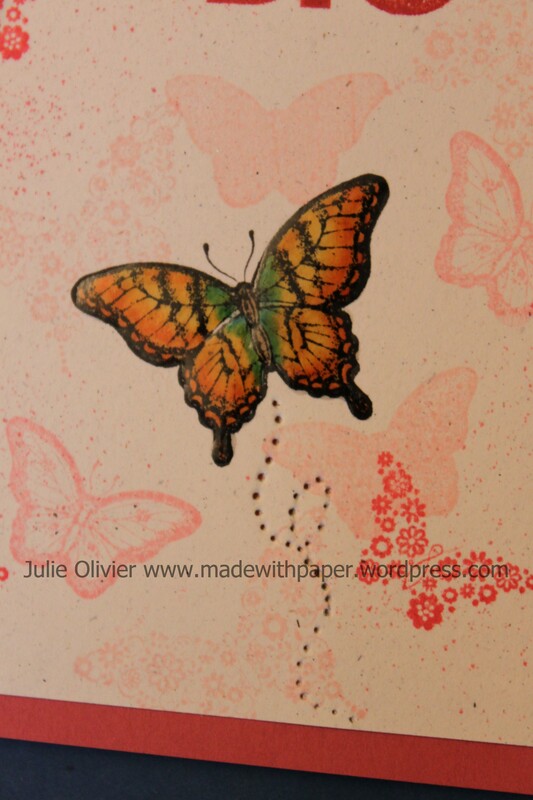 Ink: Midnight Muse, Crystal effect; Real Red, Daffodil Delight, Old Olive Stampin’ Markers. This is the card I made for my brother. 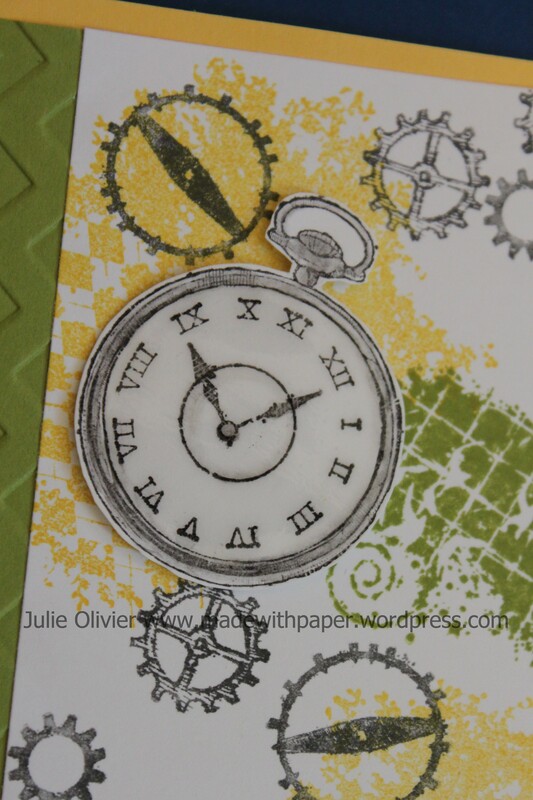 I used a new stamp set from the big catalogue called “Clockworks”. I think this set has great potential especially for masculine birthday!!! (Those are always harder to do, it seems…) I used the color combination of Daffodil Delight, Lucky Limeade and Basic Gray. For the clock, I wanted to make it look like there was a glass over it, so I used Crystal Effect all over it. I know it’s hard to see on the picture, but in real, it appears shiny and it’s really nice, trust me!!! 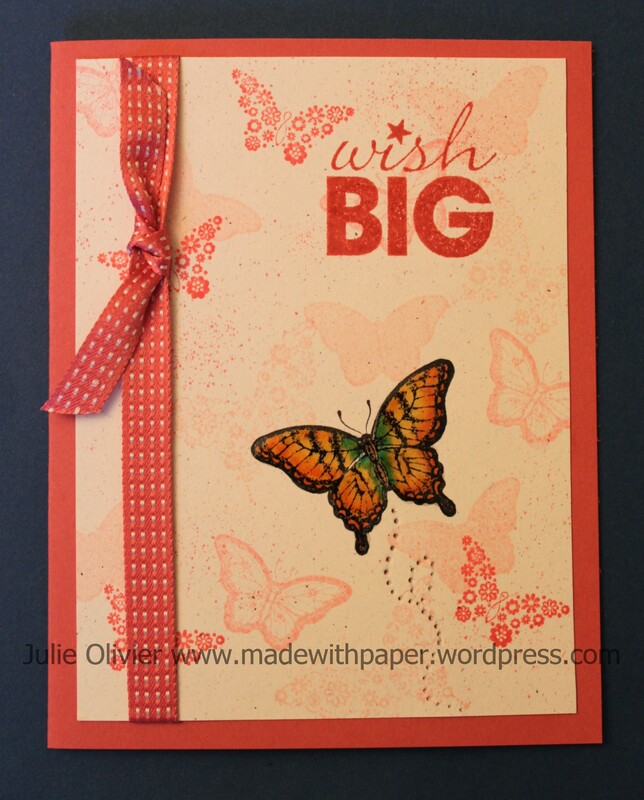 I used the new Chevron embossing folder in the background. 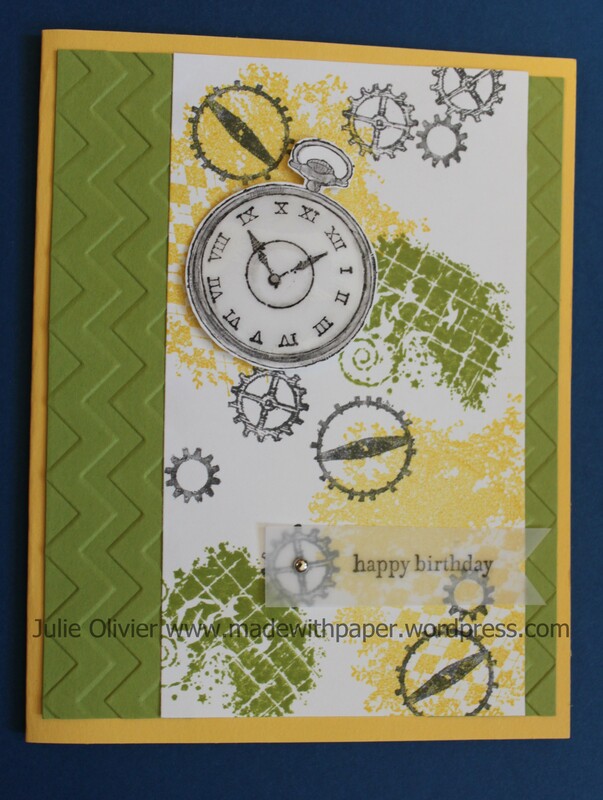 Also, I stamped the happy birthday on Vellum card stock and attached it with a mini silver brad. Others: Silver mini-brad, Crystal Effect, Blender pen, dimensionals.